Congratulations to the winners of the Christmas mystery giveaway. Rhys Bowen's Away in a Manger goes to Anita Y. of Barnesville, GA. Glen D. of Yuba City, CA won Sally Goldenbaum's Trimmed with Murder. 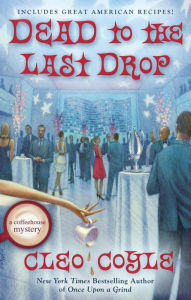 This week, Cleo Coyle has offered to send one lucky winner a personally autographed copy of the latest Coffeehouse mystery, Dead to the Last Drop. This time, coffeehouse manager and master roaster Clare Cosi heads to Washington, D.C. Her NYPD detective boyfriend has been working there. Clare is overseeing the opening of a second Village Blend coffeehouse. Then, she's asked by the White House to consult for the coffee service for a Rose Garden wedding. Everything looks beautiful as Clare housesits in a Georgetown mansion, and consults for the Smithsonian. Then, she gets mixed up with the State Department and the President's daughter. It isn't long before she's on the run. It seems Washington can be trouble. So, Cleo will send the autographed copy, and I'll mail a second hardcover to a second winner. In order to enter, email me at Lesa.Holstine@gmail.com. Your subject heading should read "Win Dead to the Last Drop." Please include your name and mailing address. Entries from the U.S. only, please. The giveaway will end Thursday, Dec. 10 at 6 PM CT.
Cleo Coyle (aka Alice and Mark) write amazing books. Each one just gets better. Oh, I hope that I'm the lucky one!!!! :) Thank you, Cleo (Alice and Mark) for the chance to win! One of my favorite cozy series! Awesome giveaway. Thanks for the chance & Happy Holidays! i love these books am addicted and cant wait to read.